When using a Pie Chart or Table Datablock, you have the option in the Property Manager to either choose Data from a Single Metric or Data from Multiple Metrics. When you choose Data from a Single Metric, you are telling the system to automatically split the metric selected into different slices of the Pie Chart or rows of the Table. Because of this, the only metrics that you can select to populate the Pie Chart or Table are Attributed Metrics. Attributed Metrics are Metrics that contain Dimensions, or a list stored underneath them. They typically have the word "by" in the name (like Sessions by Source, Revenue by Country, etc.) and have the "L" sign before their name in the Designer. Since a list containing Dimensions is stored underneath, the system can automatically map each slice of the Pie or row of the Table to a different Dimension and populate the Visualization Type. When you choose Data from Multiple Metrics, you are telling the system that you want to manually map each slice of the Pie Chart or row of the Table. You can select either Attributed or Non-Attributed Metrics for this, but if the metric is Attributed then you will be prompted to select a single Dimension. 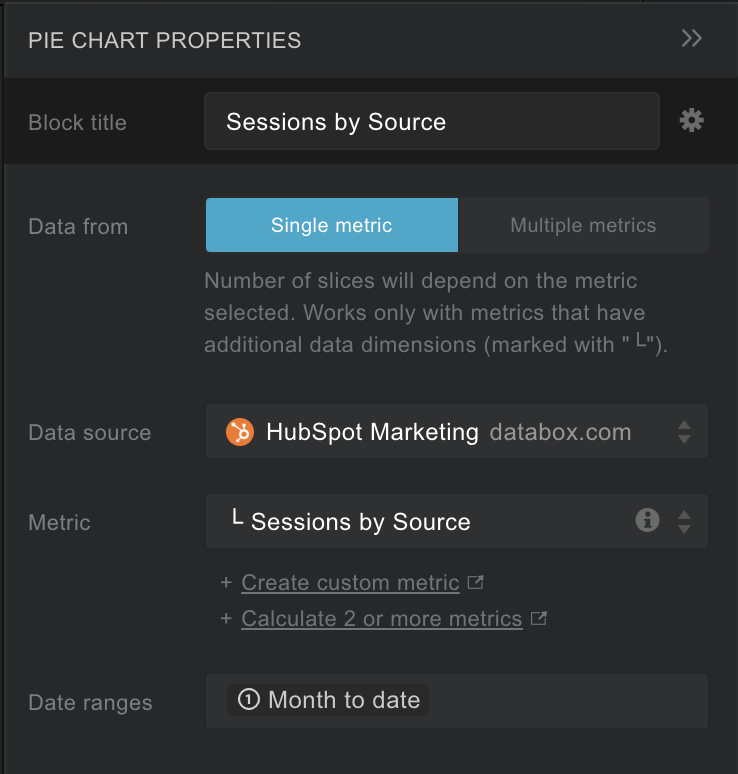 So, if you choose HubSpot Marketing - Sessions by Source, you will need to then select one Dimension (Direct or Referral or Organic, etc.). This will populate one single slice of the Pie Chart or row of the Table. You can then click + New Row in the Property Manager to add and map the next slice of the Pie Chart or row of the Table. NOTE: This option is not currently available for the Advanced Table and Leaderboard Visualization Types.